The Hoover MaxExtract77 Multi-Surface Pro Carpet & Hard Floor Cleaner (Model FH50240) promises to give you drier floors in record time with its special MaxExtract DualV Nozzle Technology which enables the cleaner to pull up more dirty water. This unit also gives off pressurized water that loosens and lifts tough stains. The MaxExtract does work pretty good, I have experienced a MaxExtract model pulling lots of sopping wet stuff out of carpets on more than one occasion. I also used one to pull water from an aquarium one time, in a pinch. Another plus is the unique SpinScrub Technology with 77 counter rotating brushes that promise to remove dirt at every angle. There are also different SpinScrub Setting Options you can choose from: Gentle Scrub Mode, Spill Pickup Mode, and Power Scrub Mode. These features all make this a pretty nice machine, let’s take a look at the details a little further. So far, there are only 42 customer reviews for this product on Amazon.com. Reviews are quite mixed—almost split in half, with 25 positive reviews and 17 feedbacks that gave ratings below 4 stars. Disappointing suction – It’s unfortunate that the manufacturer advertises this product as having superior suction – quite a lot of customers seem to disagree. Reviewers were dismayed to report that although this cleaner does a good job of removing dirt, it performs poorly when pulling out dirty water from the floor. I have had good experiences with the MaxExtract line, but my expectations may not have been very high as well either. Efficiently removes dirt and stains – Customers agree that the Hoover MaxExtract77 FH50240 delivers when it comes to cleaning. Carpets look better after each clean and even tough stains are removed. Convenient Tank System – Reviewers also love the two separate tanks for the clean and dirty water. The tanks have generous space so refilling doesn’t need to be as frequent. Emptying and filling the tanks are also easy and not messy. Solid build – Amazon users were also happy with the sturdy construction of this product. The parts seem to be made of durable and high quality materials. 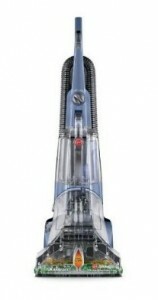 In general, there is no doubt that the Hoover MaxExtract77 performs well when it comes to cleaning. Although a bit heavy to push around, this unit is effective at giving carpets and floors a deep and thorough clean. Even unpleasant odors are removed. The only major downside that customers presented was the not-so-powerful suction. The manufacturer enthusiastically advertises this as a product that dries your floors quickly and effectively, but perhaps you might need to lower your expectations a little bit. Like any other floor cleaner, you may still have to make several passes before all the dirty water is sucked out of your carpet or floor. As long as you have realistic expectations about this product, you should be able to use it without any problems.